Many people view going to the dentist as a frightening experience. At AA South Florida Dentistry, our highly trained dental team works to ensure that you are comfortable and at ease during your treatment. They are very friendly while still maintaining a high level of professionalism. Call us anytime at (305) 661-9556 to schedule an appointment. No matter how long it’s been since your last appointment, our staff will treat you with respect and courtesy. Whatever your anxieties may be, we will work with you to put your mind at ease. Clients who require special treatment services can be sedated in-office. Just be sure to make plans with family or friends to transport you to and from the appointment. We strive to ensure that whatever physical, psychological, or emotional concerns you have regarding a visit to the dentist are taken care of before any treatment is done. Our dentists have over 40 years of experience in the dental field and strive to stay up to date on the best dental procedures. 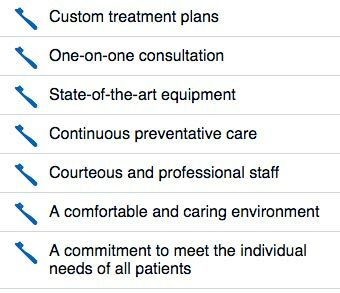 Our staff is committed to meeting the individual needs of each patient. We have custom treatment plans available and will discuss what we think your dental needs are during a one-on-one consultation. The equipment in our office is state of the art, and we offer continuous preventative care. Patients of our office travel from as far away as South Beach simply because of our courteous and professional staff and Dr. Faine’s well-known expertise in dentistry. No matter what your needs are, we can also help with financing your dental procedure with low monthly payments. We work closely with a few financing companies that will be sure to give you the best rate, just mention you are our patient. Call us at (305) 661-9556 to schedule an appointment at our office.